Whether you’re a true microbrew aficionado, or you just like to try some of the unique beers that come from local breweries, you’ll love Premiere #1 Limousine Service’s central PA craft beer tours. These gatherings are organized completely by our company — all you have to do is relax and enjoy both the ride and the brews! Thanks to the upsurge in the craft beer market, central PA brewers are attracting the taste buds of people from the region and beyond. This makes cities like York and Lancaster the newest hot-spot beer tourism destination. 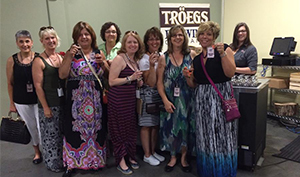 In fact, one of our most popular beer adventures is a Hershey/Harrisburg craft beer country limo tour! If you want to book a seat on one of our very popular Pennsylvania brewery tour deals, please fill out the quick contact form below, or give us a call at (717) 616-8995. We’re happy to explain exactly which breweries we’ll be visiting, as well as other options for making your tour spectacular. Don’t forget that all of our PA brewery tour deals are better when you go with someone special, so tell your family members and friends! One of the biggest drawbacks of taking brewery tours in Harrisburg, PA is that the drinking of alcohol is part of the experience. This means that it can be a safety risk to travel in your private vehicle while sampling all the craft beers in the region. A better solution is to take advantage of one of our PA brewery tour deals. This will enable every person in your party to taste-test to their heart’s desire without having to get behind the wheel. It’s the safe and responsible way to support the local breweries. Are you looking for a venue for your next special occasion, such as a birthday, bachelorette party or anniversary? Why not consider a central PA craft beer tour? Premiere #1 Limousine Service offers these types of local tours regularly, and they give you the chance to get together with the people you care about most. After all, everyone enjoys being chauffeured and feeling like royalty for a day, which is why our Harrisburg tours are so popular!